Ashton windmill is a Tower mill in Chapel Allerton, between Wedmore and Weare, in Somerset, England. It is sited on a high-point known as the Isle of Wedmore in the Somerset Levels and has a tower is over 7.5 metres (25 ft) high with stone walls that are 60 cm (2.0 ft) thick. The sails are 13 m (43 ft) across and used to be covered with canvas. The last millstones were 1.2 m (3.9 ft) across and the millstones used to grind wheat for flour and beans for cattle food. The first mill on the site was medieval, but the present structure probably dates from the 18th century. It was modernised in 1900 with machinery brought from the demolished Moorlinch mill, and iron hoops around the building being added. It was restored in 1967. The mill has been designated by English Heritage as a grade II listed building. It is now preserved, having been given to Bristol City Museum in 1966, and is now owned by Sedgemoor District Council, and maintained by volunteers. Ashton Windmill is open from Easter through to September, Sundays and Bank Holidays, 2:30 – 4:30pm. Admission is free. Group visits available by arrangement. 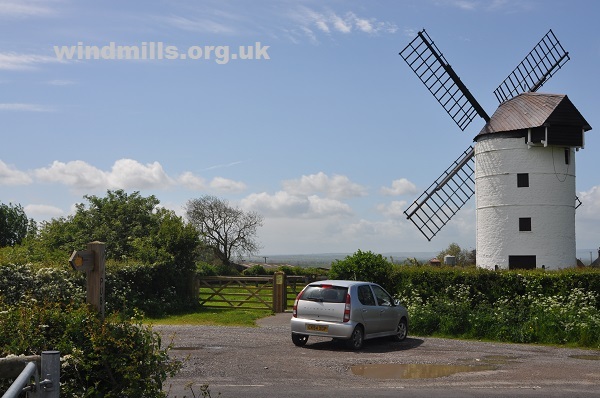 Ashton Tower Mill, near Axbridge, in the Sedgemoor district of Somerset. Maps showing the location of Ashton windmill and further details. More pictures of Ashton Tower Mill.